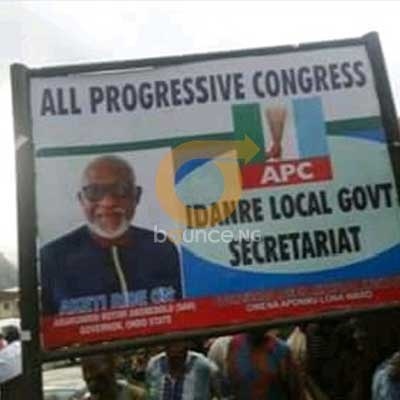 It appears the alleged idle hands of the APC government in Ondo state has not only turned to the devil's workshop but also an element of frivolity. While some party members are yet to come to terms with the unabashed show of disappointment being peddled by party leaders, indigenes of the state are deeply worried about the future. As state government is busy flagging off projects with elaborate celebration across the state only to be abandoned later, local government executives are regularly inaugurating petty ventures that have no impact on people. Credence was laid to this fact at the official commissioning of a sign post by the executive Chairman of Idanre local government, Biyi Ayannuola on Tuesday. The inauguration of the sign post, which was said to have been donated by Hon. Adeolu Akinrinlola, has stirred an hornet's nest even among party members. "Of what importance is sign post to the people? This is an obvious sign that we have lost our sense of focus as a party and if care is not taken, we will pay dearly for this show of unseriouness by our leaders." Said an APC member who preferred anonymity. Also reacting to the development, Chief Ebeneezer Adebanjo posited that he was not surprised with the way things are going. "When you rode into power on the back of deception, you will definitely rule the people with propaganda. "Today, a sign post was commissioned with pomp and pageantry. Tomorrow, I wouldn't be surprised if the whole state is shut down in celebration while trying to inaugurate a flood channel somewhere. "If a borehole, school toilet and the likes were commissioned in a big way, then I see no reason why a sign post that carries the portrait of the state governor should not receive an elaborate commissioning." He said sarcastically. The event, which attracted party leaders and some state government functionaries, was described as a vile achievement that neither adds value nor benefit to the town or it's people.